A robot that consists of a compact disc (CD) and an embedded microcomputer has been developed as a robotics learning tool for elementary and junior high school students. 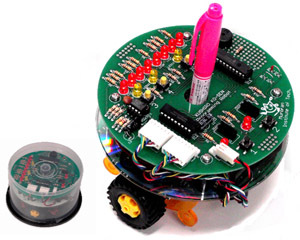 The students can program the robot to draw a variety of shapes by placing a pen in the center hole of the CD. As the movement track of the robot can be recorded, the students can preserve their devised program execution results. In addition, intuitive instructions can be used to control the robot. This allows to input the program by operating several push-button switches. The program instructions can be viewed on the robot’s 8 LEDs-display interface. This robot is a unique teaching tool, which can be used to learn the mechanism of the robot composed of sensors, actuators, and a computer, without using a personal computer. T. Noguchi, H. Kajiwara, K. Chida, and S. Inamori, “Development of a Programming Teaching-Aid Robot with Intuitive Motion Instruction Set,” J. Robot. Mechatron., Vol.29, No.6, pp. 980-991, 2017. M. Virnes et al., “How children’s individual needs challenge the design of educational robotics,” Proc. of the 7th Int. Conf. on Interaction design and children, pp. 274-281, 2008. N. Ishii and K. Miwa, “Creativity Education based on Participants’ Reflective Thinking on their Creative Processes,” J. of JSAI, Vol.19, No.2, pp. 126-135, 2004. A. Mitani and T. Hosoya, “Mechatronics Education in School of Design – Development of Educational Tool to Study Design Expression Using Mechatronics,” J. of the Robotics Society of Japan, Vol.23, No.5, pp. 629-637, 2011. G. Endo, S. Hirose, and H. Yamada, “Development of an Educational Fish-like 1-DOF Gliding Locomotion Robot with Passive Wheels: An Educational Tool to Bridge a Classroom Lecture and a Hands-on Experience for Highschool Students,” J. of the Robotics Society of Japan, Vol.31, No.2, pp. 124-132, 2013. M. Iwamoto, Y. Mizutani, N. Suzuki, and N. Nakamura, “Practical Education using Robot Kit Bontenmaru for Children,” J. of the Robotics Society of Japan, Vol.24, No.1, pp. 2-6, 2006. K. Chida, T. Noguchi, H. Kajiwara, M. Arai, and S. Inamori, “Programing Education with Robot for Novice User,” IEICE Technical Report, ET, Vol.106, No.166, pp. 21-24, 2006. T. Noguchi, H. Kajiwara, K. Chida, and S. Inamori, “Development of Teaching Materials Robot for Instrumentation and Control,” JSiSE Technical Report, Vol.27, No.6, pp. 217-220, 2013. T. Ito, J. Arai, K. Isetani, T. Kakimoto, and K. Sawano, “Robot Handcraft Class Using Autonomous Sweeping Robot “BEAUTO”,” J. of JACT, Vol.14, No.3, pp. 9-12, 2009. C. J. Solomon and S. Papert, “A case study of a young child doing turtle graphics in LOGO,” 4 Pro. AFIPS ’76, pp. 1049-1056, 1976. Y. Idosaka, “Peta-gogy for Future: Information Studies in Junior High School,” J. of IPSJ, Vol.53, No.12, pp. 1310-1313, 2012. S. Kanemune, T. Nakatani, R. Mitarai, S. Fukui, and Y. Kuno, “K12 Education and Evaluation Using an Object-Oriented Programming Language,” J. of IPSJ, Vol.44, No.SIG 13 (PRO 18), pp. 58-71, 2003.